December 14, 2016, 9:25 a.m. The food on the go market is set to grow over the next year; a new YouGov report on the industry indicates how brands can capitalise on this potential. One brand – Greggs – is showing the way. The food on the go industry is worth billions, and is set to grow further in the coming years. Our new ‘Food on the go’ reports indicates that over a million British adults have started buying food over the past year (2% of the population). As a result, with Britons getting used to eating ‘al desko’, it’s important for brands to position themselves correctly in order to cater to evolving consumer dining habits. 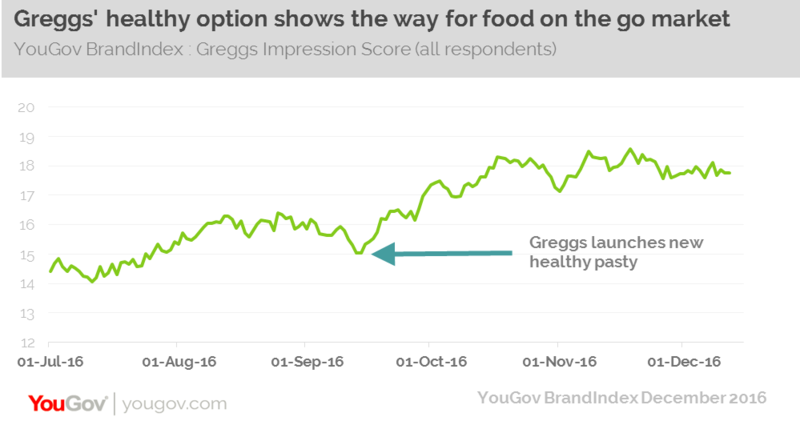 YouGov’s brand tracking data shows one brand that has seen particular success in this is Greggs, which has adopted a strategy that challenges consumer assumptions. Traditionally known for its range of pasties and other baked goods, it has introduced a series of healthier options into stores in recent months, which are on sale alongside its core offering. As a result of it now selling such products as the new ‘healthy pasty’ its Impression score – whether someone has a positive or negative impression of the brand – has improved. Indeed, the data shows a notable jump of over 6 points in the days following the release of the calorie conscious snack. One of the key aspects of Greggs’ success is that it is able to offer its customers variety and price. This is crucial for two different reasons. Firstly our reports shows that there is still a large group of consumers falling out of love with food on the go. The data indicates that a fifth (21%) are buying less that they did a year ago. Of this group, over four in ten say they did so because of the desire to save money, while a quarter say the decision was motivated by a change of diet. Secondly, there is a concerted effort from over half of the public to eat healthily; our data indicated that 58% make an effort to get their five-a-day (compared to 33% that don’t). One last lesson for other food on the go brands is to adapt to customers that want a healthy option, without neglecting their core offering. Greggs has been able to retain customers that love what it has stood for in the past, whilst managing to satisfy those whose tastes have changed.